Piecemeal, the trajectory of Jeffery Bloom's career seems a bit unorthodox. The jump from professional jockey to the corporate software technology industry just isn't something you see every day. Now, the 54-year-old Bloom seems to have found his niche as the managing director of his own racing, pinhooking, and breeding operation. Looking back, the widely-skewed points of his resume seem to have converged toward a single goal: providing a “once-in-a-lifetime” experience in Thoroughbred ownership. For the three partners in the filly Midnight Bisou, that dream no longer seems so far away. Undefeated this year, the daughter of Midnight Lute made her case as one of the top sophomore fillies headed toward the first Friday in May when she circled and then absolutely demolished the field in Saturday's Grade 1 Santa Anita Oaks. Midnight Bisou is out of the graded stakes-winning mare Diva Delite (Repent), and was bred in Kentucky by Woodford Thoroughbreds. Consigned to the 2016 Keeneland September yearling sale, the filly RNA'd at $17,000. At the next spring's OBS April 2-year-old sale, she caught Bloom's eye with a :10 1/5 breeze. If Bloom's finance degree from San Diego State University taught him anything, it was that discipline within a budget is of primary importance in the sales ring. While of course everyone at the sale would like to be able to buy the Ferrari-type horses, he, like many others, has to buy within a strict range of prices and find value. Nerves struck him when Midnight Bisou entered the sales ring, but just a few minutes later Bloom had secured the filly for a final bid of $80,000. Despite his stringent purchasing policies, he remembers being grateful that the bidding stopped when it did because he “just wasn't sure” how high he would have gone to get her. Five starts later, the investment is proving to be a wise one. Midnight Bisou (bisou is the French word for “kiss”) is one of the leading prospects for the Kentucky Oaks and has earned a total of $450,000. The former jockey, winner of just under 100 races in his career, has been known to ride his stable's horses in the mornings from time to time. It's all a part of his eclectic list of daily activities, which could include any number of racing-related pursuits. Bitten by the horse bug at age 13, Bloom began living in a tack room the very next year. Veteran horseman Luigi “Muzzy” Francis took the teenager under his wing, giving Bloom a hard-knock education from the ground up. It was this early education that helped Bloom score a position as the go-to breeze rider for legendary trainer Charlie Whittingham. Among other top horses, Bloom worked Kentucky Derby and Preakness winner Sunday Silence. That last lesson may have taken a little longer to sink in. When his riding career was finished, Bloom went back to college and eventually got a job as a financial analyst. Miserable in the office setting, he changed gears to software technology, orchestrating the business development for an engineering firm. Still, the former jockey had trouble keeping his motivation intact. 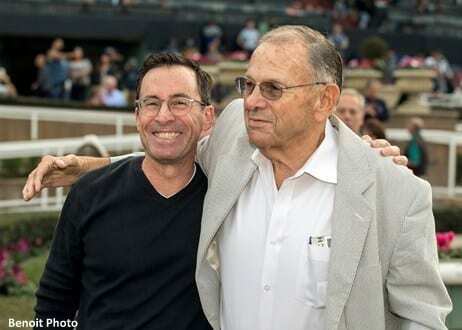 He'd stayed in touch with most of his contacts in the racing world, and when the opportunity came to manage West Point Thoroughbreds newly-forming west coast division, Bloom jumped on it. Seven years later, he applied what he'd learned to his founding his own racing stable. Just like its founder, Bloom Racing Stable has an interest in nearly every piece of the racing world. The operation maintains approximately 30 broodmares, another 30 or so weanlings or yearlings (depending on the sales season), and 30 more horses of racing age. If that doesn't sound hectic enough, Bloom is also a part-time racing analyst on the radio and an active member of the advisory board for the Thoroughbred Aftercare Alliance. In his spare time, Bloom has been working to update the stable's website to better facilitate communications with the different partners and syndicate members. In the future, he envisions a private web portal so that each owner can see the most up-to-date information on his or her horses. It takes a bold person to follow Muzzy's advice, embracing passion over logic when it comes to livelihood. But Bloom just kept finding his way back to the racetrack, and the risks have definitely paid off. This entry was posted in Connections, NL List, People and tagged Bill Spawr, bloom racing stable, Breeders' Cup presents Connections, Chelsea Hackbarth, Connections, jeffery bloom, kentucky oaks, midnight bisou by Chelsea Hackbarth. Bookmark the permalink.